Michael Shermer has 1 media appearance. Shermer appears at the New Mexico Coalition for Excellence in Science and Math conference where Bookworks will be selling his book. Monday, February 2, 7:30 p.m. In The moral arc, Shermer shows us how science and reason move humanity toward a more just world. This provocative and compelling book has been praised by Jared Diamond, Steven Pinker, and Lawrence M. Krauss as an important work of skepticism, science, and reason, both thrilling and fascinating, which will forever change your view of the history and destiny of humankind. This ambitious and thoroughly researched tome is a remarkably accessible work of scholarship that explains that the fabric of modern morality derives not from religion, but in large part from secular notions of rational empiricism. Learn how abstract reasoning, rationality, empiricism, skepticism--scientific ways of thinking--have profoundly changed the way we perceive morality and, indeed, move us ever closer to a more just world. Dr. Michael Shermer is the Founding Publisher of Skeptic magazine, a monthly columnist for Scientific American, a regular contributor to Time.com, and Presidential Fellow at Chapman University. He is also the author of The Believing Brain: From Ghosts and Gods to Politics and Conspiracies; The Mind of the Market, on evolutionary economics, and Why Darwin Matters: Evolution and the Case Against Intelligent Design. He has been a college professor since 1979. 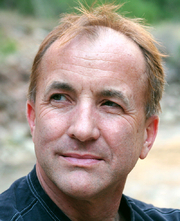 Michael Shermer is an enthusiastic cyclist as well as a leading skeptic. Dr. Michael Shermer is the Founding Publisher of Skeptic magazine, the Executive Director of the Skeptics Society, a monthly columnist for Scientific American, the host of the The Skeptics Society’s Distinguished Science Lecture Series, and Adjunct Professor at Claremont Graduate University and Chapman University. Dr. Shermer’s latest book is The Believing Brain. His other books include: The Mind of the Market (on evolutionary economics), Why Darwin Matters: Evolution and the Case Against Intelligent Design (about evolution, how we know it happened, and how to test it), Science Friction: Where the Known Meets the Unknown (about how the mind works and how thinking goes wrong), and The Science of Good and Evil: Why People Cheat, Gossip, Share Care, and Follow the Golden Rule (on the evolutionary origins of morality and how to be good without God). He wrote a biography, In Darwin’s Shadow (about the life and science of the co-discoverer of natural selection, Alfred Russel Wallace). He also wrote The Borderlands of Science (about the fuzzy land between science and pseudoscience), and Denying History (on Holocaust denial and other forms of pseudo history). His book How We Believe: Science, Skepticism, and the Search for God, presents his theory on the origins of religion and why people believe in God. He is also the author of Why People Believe Weird Things (on pseudoscience, superstitions, and other confusions of our time). He also wrote The Soul of Science (a brief statement of belief on science, the soul, and the afterlife, from a scientist’s perspective) and co-edited (with Pat Linse, the co-founder of Skeptic magazine) The Skeptic Encyclopedia of Pseudoscience (an analysis of the most prominent controversies made in the name of science). Michael Shermer's book Heavens on Earth was available from LibraryThing Early Reviewers. Michael Shermer's book Skeptic: Viewing the World with a Rational Eye was available from LibraryThing Early Reviewers. Michael Shermer's book The Moral Arc: How Science and Reason Lead Humanity Toward Truth, Justice, and Freedom was available from LibraryThing Early Reviewers. Michael Shermer's book The Believing Brain was available from LibraryThing Early Reviewers. Michael Shermer is currently considered a "single author." If one or more works are by a distinct, homonymous authors, go ahead and split the author. Michael Shermer is composed of 6 names. You can examine and separate out names.